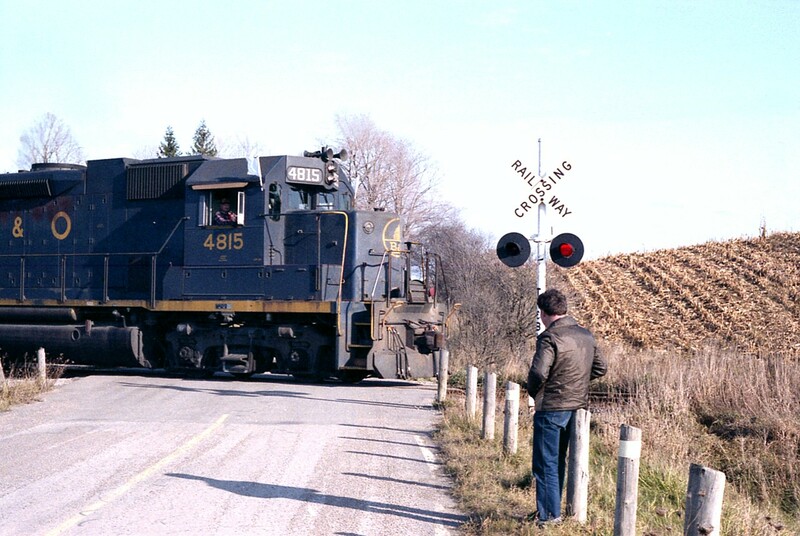 Railpictures.ca - A.W.Mooney Photo: In regards to RP pic #31269, I just felt the need to prove Doug’s great shot for what it was by submitting this sneaky image of him watching the train pass by. Rarer still would be a picture of him waving. Never caught him at it. :o) This occasion was the very first run of the TH&B version of the “Nanticoke”. We hopefully are going to see some marvellous photos of Dougs on Railpics in the coming months. | Railpictures.ca – Canadian Railway Photography – photographie ferroviaire Canadienne. Caption: In regards to RP pic #31269, I just felt the need to prove Doug's great shot for what it was by submitting this sneaky image of him watching the train pass by. Rarer still would be a picture of him waving. Never caught him at it. :o) This occasion was the very first run of the TH&B version of the "Nanticoke".We hopefully are going to see some marvellous photos of Dougs on Railpics in the coming months. You should have said that, Todd. You might give one of the miscreants an idea. You know….someday someone will post one of you on here!